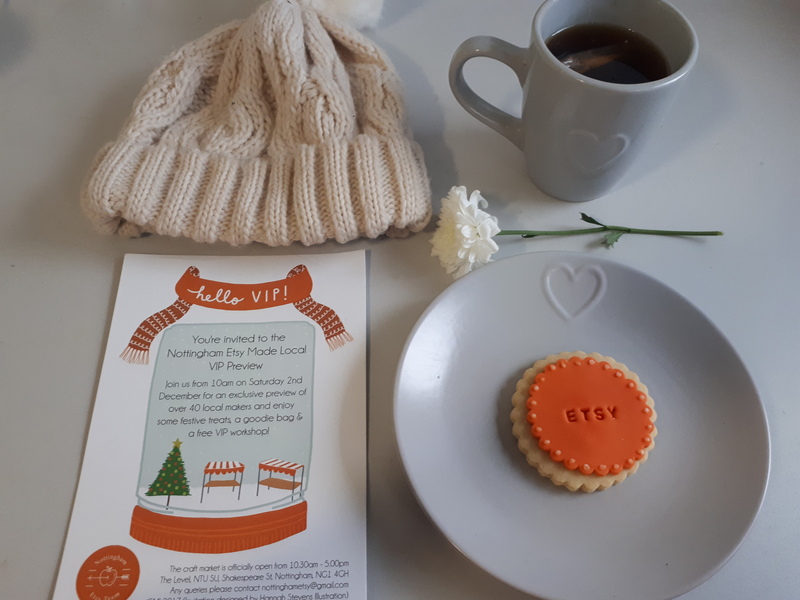 The magazine that I’m the Editor-in-Chief of, Platform Magazine, was invited as a VIP to the Etsy Made Local event at the Nottingham Trent Student Union today. I was planning on going anyway, but when my society coordinator gave me the orange envelope Etsy had sent out, and I opened it to find a VIP pass I was so super excited. For Platform Magazine I did a news article about it, however, I thought it would be nice to do a blog post too so I can tell you more about it from my personal perspective. VIP and tea… That biscuit was exceptionally tasty too. I often use Etsy for present shopping. For my boyfriend’s birthday, I got him an engraved pick bracelet, and for Christmas I got my best friend… I can’t say because I know she’ll be reading this! But something very cute that I will talk about in another blog post, because the customer service from that seller was above and beyond. And precisely, that personal level with Etsy is what makes it so attractive to me, as it is small businesses sharing their lovingly-made crafts with the world. Nottingham is such a creative city to live in, so of course, the venue was jam-packed with the most diverse range of items. It is so easy just to buy presents from your big-brand retailers and be done with. But taking the time to find something with that little je ne sais quoi makes present buying all the more special, and Etsy offers a super platform for that. As soon I got in, I was greeted with lovely smiles and a cosy atmosphere. Fairy lights adorned the bannisters, making a pleasant change from the blaring club lights it usually has. I was handed a goodie bag, and I went on my way to peer around all the lovely stalls. There was no stall that was exactly the same, and they all offered a completely different atmosphere even if you only popped next door. The Etsy Leader Amy even tracked me down to hand me an Etsy cookie, which I thought just encompassed the extra care and detail the Etsy brand represents. One stall I particularly liked was Katie Abey Designs. I have actually looked at her stuff online before (in the endless hole of internet browsing), and always thought it looked so vibrant and uniquely illustrated. Talking to her today and seeing all the products looking bold and quirky on her stall only cemented my admiration for her lovely products. Marie Krnakova from MW Perfumes was also a pleasure to talk to. Her perfumes using natural ingredients and traditional methods was so interesting to hear about, and the delicate yet warm fragrance she let me try was beautiful. It was based on the fragrance Louis the 6th himself used back in the 12th Century. I love a bit of history, so I enjoyed this extra touch. I was very happy to find a sample of this in my goody bag when I got home! 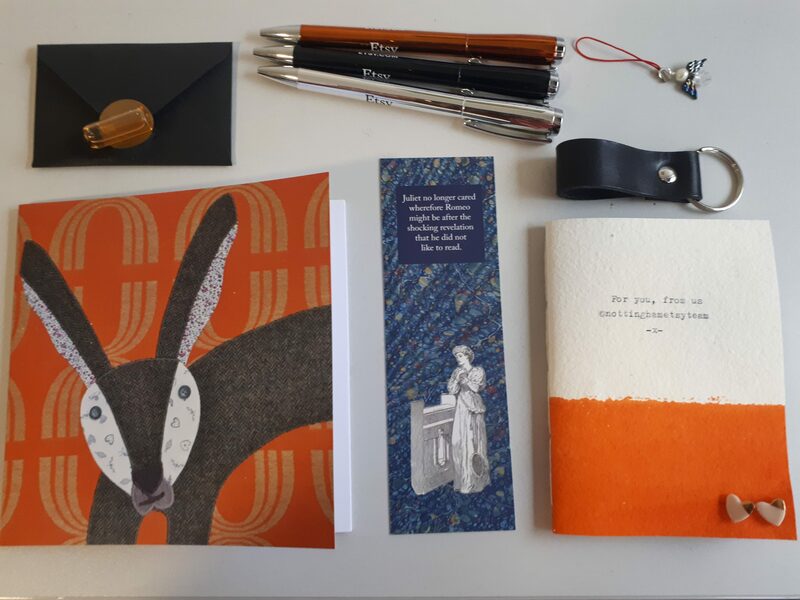 Goodie bag: Perfume MW Perfumes, angel keyring Perfidious Jewellery, leather keyring Orgill Originals, earrings Rolling Roses, bookmark The Forgotten Library, notebook Katherine Hill. I even got to make a bath bomb! I’ve never actually used a bath bomb before, but after the workshop holder showed me how making them is so fun, I may have to try! She showed me how to make a Snowball one, using half citric acid and bicarbonate of soda, then putting drops of Peppermint oil, then some glitter, and then putting it into the mould. My little sister would love making them with me, so I will definitely be attempting this at home. Overall, I had a lovely time at a very well planned event, that kept me entertained and showcased Etsy in a fine light. I will definitely have to go again next year – word on the street is that next years will be even bigger! This sounds like so much fun! Making a bath bomb.. that would have been so great! All of the things in your goodie bag look amazing! I love the rabbit picture!